Many thanks for a great three days of crowd science. Enjoyed the class thoroughly and can and will recommend it. I thoroughly enjoyed the three day course in Antwerp. Apart from being very informative and helping me put a theoretical base to my years of experience, it was entertaining as well, which made it easy to stay focused on all the information you shared. Thank you for that. We have received a great deal of information and learned a lot on these three days. 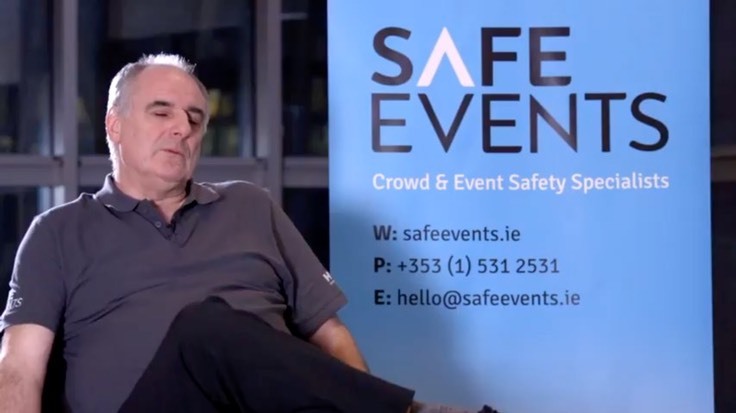 Thank you for such a wonderful and educational week.�It was great to meet you at the Crowd Safety event and I have taken away so much from these three days. I would like to thank you for three very interesting and energetic days during the short course in Apeldoorn. The short course really enhanced my knowledge on the theory and concepts you presented. KEITH – Thank you so very much for the best 3 days of learning that I have spent in sometime! I also enjoyed the collaboration with my fellow classmates. We need to expand and carry this forward throughout our sports/entertainment profession. Rebecca Wilusz, Associate Director of Game Operations & Champion at Duke University Athletics, agrees with Tiffin. “Keith has done a great job of making the information accessible – I have left the workshop with both simple and effective tools to be able to build better plans and train our athletics staff more efficiently. The knowledge gained during this course has been invaluable. Many thanks for a very informative few days last week on the course. This course raised the bar for me in terms of referencing events and utilising the tools and knowledge to better assist event organisers. Most enjoyable and useful. Thanks for all the documentation and the course itself! One of the best training courses I’ve attended in a long time. Click�here�for a 30 minute course overview. SXSW Music is one of the largest music festivals in the United States, with more than 2,000 performers playing in more than 90 venues. SXSW is the highest revenue-producing event for the Austin (Texas, USA) economy, with an estimated economic impact of $167 million in 2011. "Prof. 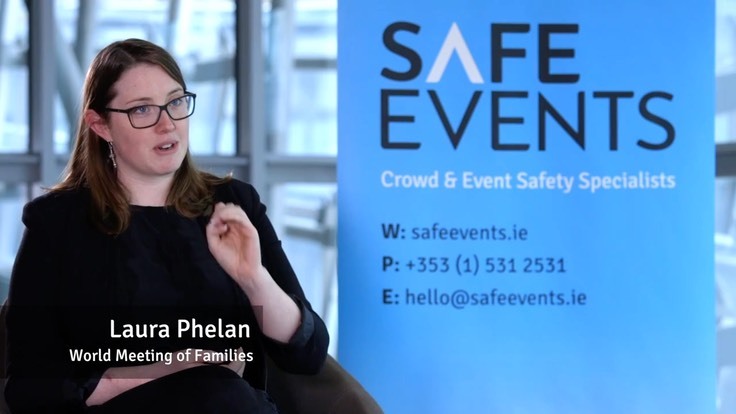 Still's crowd safety workshop gave us valuable, specific, practical information that we could use in many different ways to improve our event. It was presented in a fantastic way using talks, videos, exercises, and discussions that really brought the group together. We had 30 people, half from our organization and half were various City first responders (Fire, Police, EMS). One of the best things that happened was getting to go through two three-day workshops with all of these people that you talk with for maybe 30 minutes at most. "Thanks very much for last week – on a personal level I found your thoughts and experience intriguing and extremely thought provoking. Exactly what I was anticipating.�Today is the first day I have been� back into the office at Edgbaston – several of my colleagues have become converts!�So thanks very much again for your contribution!" "Keith was fantastic! Very knowledgable with strong delivery." "Very enjoyable course. Valuable subject matter that made me think. Trainer very knowledgable." "Very enjoyable and I have learned a great deal." "First class course.� Very well presented and used excellent examples to demonstrate the principles." "Keith is very knowledgeable in his subjects and good at explaining and delivering course content. I found the course beneficial and enjoyable." "Very enjoyable and informative course. Easy to grasp concepts and employ to real life situations. Keith put complex issues into straightforward concepts and used current, relevant examples to demonstrate principles." 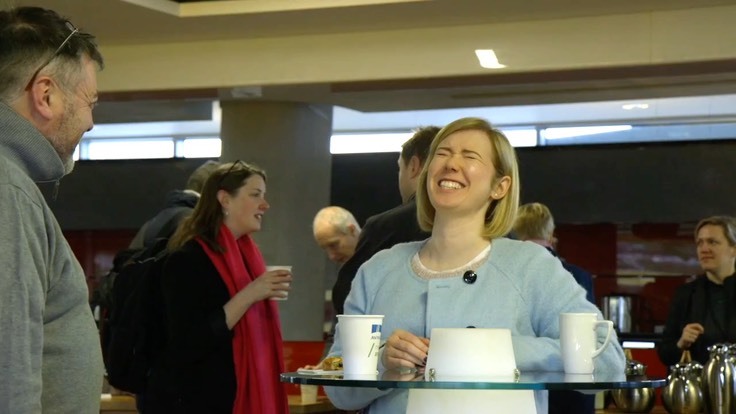 "I've been organising events for over 30 years and was fascinated in the more scientific approach given.� A charismatic presenter who makes it seem like common sense." "Fascinating and wanted to know more.� It crystalised a topic which I thought was instinctive into a more concrete set of principles." 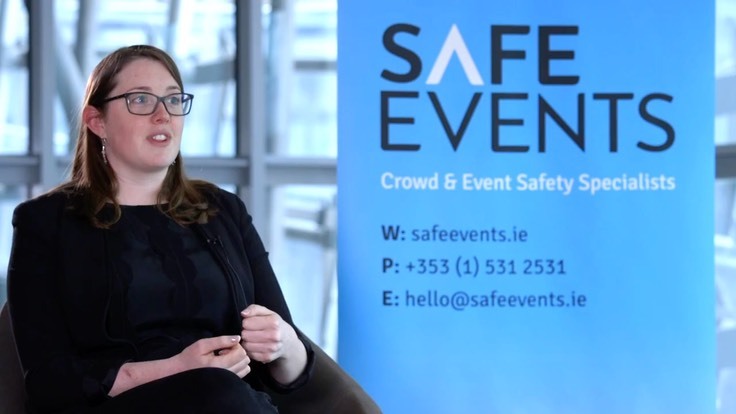 "Invaluable checklist for myself as an event organiser and as a member of a SAG to check other organisers are following correct procedures." "Fascinating information.� I would definitely attend a course that was even more in depth and over a longer period or in several sessions." "Charismatic speaker who I felt was at the cutting edge of the science.� In fact he sets the rules on this topic.� If only he was writing an additional section to the event organisers 'bible' - The Purple Guide." "I'll be reading more on the topics covered now that I've had such great information." "Prof. Still’s practises were innovative in all respects. Fantastic course.� When is there another one?" "Enjoyed the diverse range of examples of application of the process in live projects that Keith delivered."" "Keith was a great teacher and you can tell he has loads of experience which really helps." "Thanks Keith, your real world experience gives the course credibility as well as comprehensive academic knowledge. Cheers." 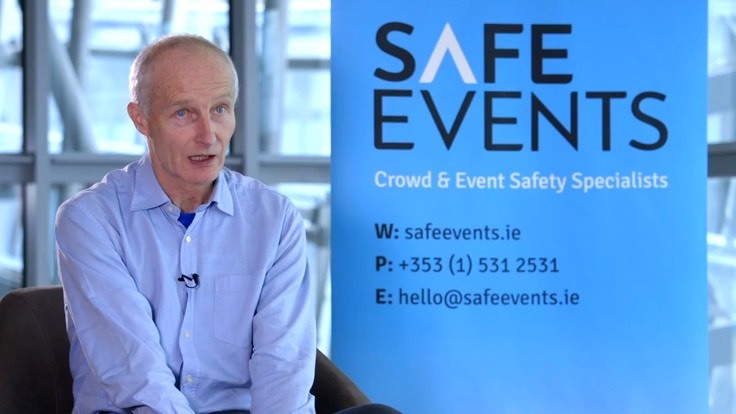 "Better understanding of crowd behaviour relevant to my own specific area." "Encouraged a warm open environment, ideal for discussion and exchange of information. Also, comfortable to ask questions and group feedback." "Excellent course giving a formula and structure to make complex important issues easy to understand and communicate. Thank you." "Both trainers delivered potentially confusing subjects in an uncomplicated way. The course was thoroughly enjoyable and I found its content will be useful to me in my work. Well worth doing." "Really very impressed with both presenters though particularly with Keith who presented the majority of the material." "A very informative and worthwhile course.� A good mixture of lecture and interactivity.� Keith and Bev are extremely knowledgeable and delivered the information / course material really well." 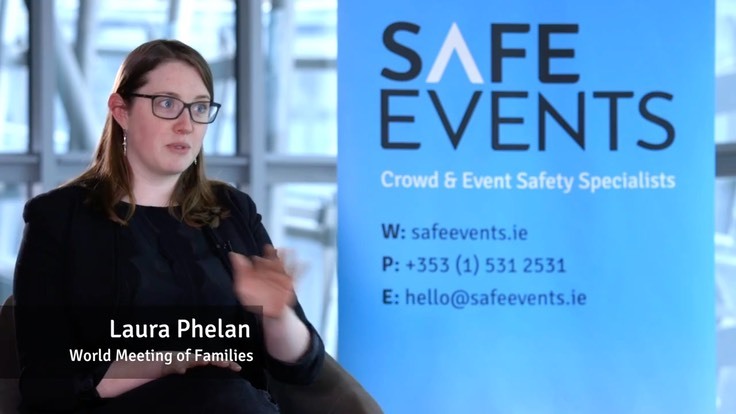 "I came to the course unsure how to begin a crowd management plan and I left with a clear focus and structure of how to write it." "Overall, a very worthwhile course, that opened doors to future learning.� Thanks." "This course gave me a good insight into how to work out basic ingress/egress and event capacities." "A very well delivered course, would advise others to attend!! Although I attended with little experience I now feel competent to put what I have learned into practice. Many thanks." 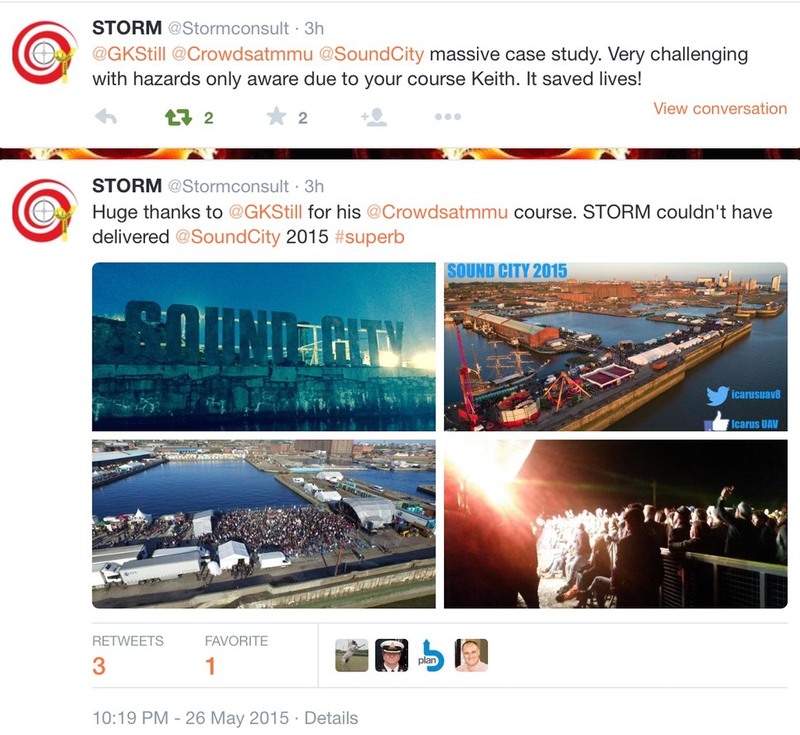 "Keith worked hard to impart his knowledge and experience in this introduction to crowd dynamics... I found his input to be very informative and of value to me in my role. (Policing Major Events)"
"It was quite clear that both trainers had prepared very well for the course and used their extensive knowledge to support the learning environment for all of the students"
"Very impressed with�Keith Still's understanding of the problems and his ability to translate that to my level." "A well paced course with plenty of opportunity to apply the principles and objectives to your own events.�1st class lectures." 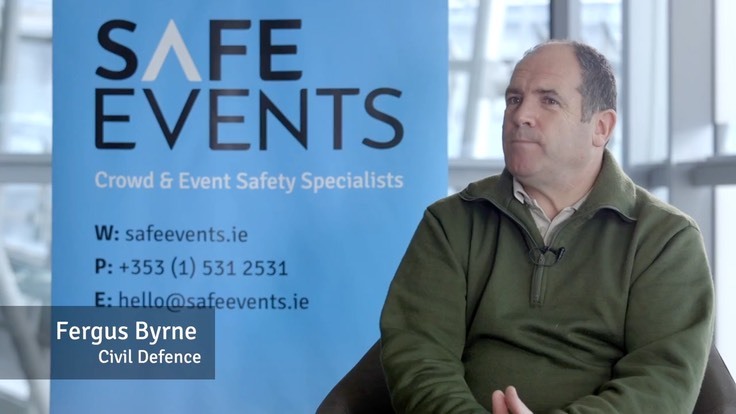 "As a silver/bronze commander in charge of major events in both a large busy city and a football stadium, I feel confident that I can now plan and prepare to ensure a safer ingress, circulation and egress of crowd. 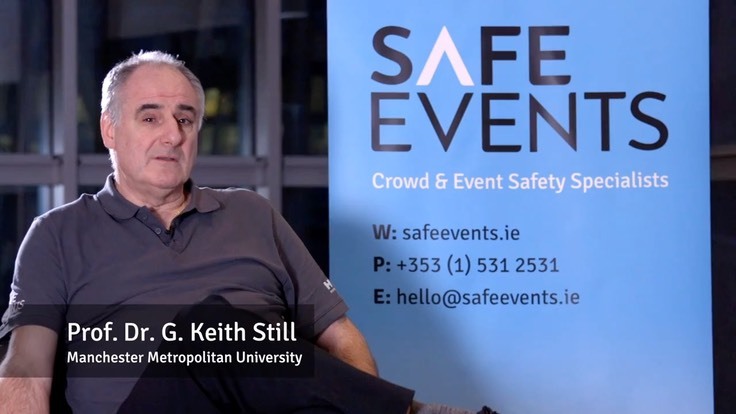 Thanks for this course"
"Keith is an expert and an inspiration when talking about crowds"
"It was excellent having Keith presenting as a practitioner and expert"
"Excellent delivered course. 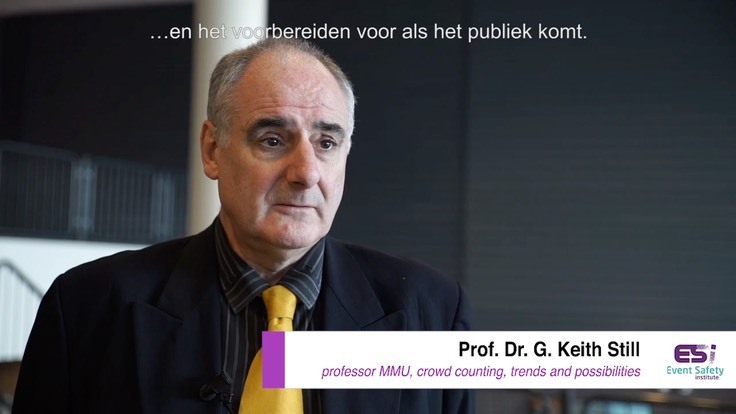 Throughout the course found myself applying the models to my events and policing issues"
"Prof Keith Still's presentations and knowledge knows no bounds. The course was fantastic. I am taking so much away, more especially a case study to review that I have not been previously involved in." "This course is a must for emergency planning officers and silver support officers." "This was singularly the most informative and impactive course I have ever attended. Your depth of knowledge, experience and delivery style was second to none." "Keith’s delivery is first class and put across his points in a very approachable and understandable manner." "This is a must attend course for those making critical event decisions"
"Excellent presentation - now understand the relationship between density and crowd flow and the importance of applying the use of (flow simulation tools) towards good planning"
"The whole course / workshop was excellent and I thoroughly enjoyed it, learnt a hell of a lot and would recommend this to anyone involved in organising an event in the county. Thank you Keith, excellent." "The course provided an excellent insight of how to plan and prepare for an event at which it is anticipated there will be large crowds. It highlighted possible problematic situations/pitfalls and explained well what measures should be implemented to either prevent these or how to deal with them." "Exceeded my expectations and provided very useful and relevant information"
"This event covered a good number of topics within this subject highlighting areas that in the past have been overlooked"
"Keith's examples and photographs/film support - excellent communicator and Course Director."